WEST LONG BRANCH, N.J. (WLS) -- Monmouth took on Georgetown Tuesday night, but the real show was on the sidelines. 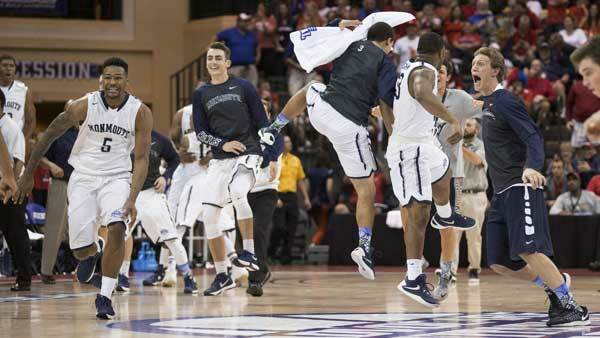 Monmouth's bench players are making a name for themselves with their choreographed celebrations. They pump iron, mimic planes taking off and - believe it or not - a reproduction of the Sistine Chapel ceiling. The bench mob even has its own Twitter account that celebrates their antics. GIF away, Monmouth bench! The NCAA isn't stopping you. Monmouth's over-the-top bench celebrations aren't going anywhere after becoming the toast of college hoops, passing muster of a rules interpretation by NCAA officials. NCAA spokesman David Worlock said this week that the celebrations are OK and not harming anyone. He says the Hawks reserves are just having fun and not coming on the court. Monmouth's players have gained national acclaim for their entertaining routines, spicing up big moments during games and racking up likes and shares as fans spread the moments online through GIFs and short videos. Worlock says the NCAA received a request for a rules interpretation and determined the celebrations aren't interfering with the game. The mid-major from central New Jersey has wins over UCLA, Notre Dame and USC. The wins earned considerable buzz for Monmouth (5-3) on campus, with players saying they're getting recognized more around school.